A new Victorian thong brand has hit the market offering two key points of difference; funky adornments… and an environmental conscience. Based in the surf centre of Torquay, Salt Session, which launched last November, was created to embody a passion for surfing, adventure travel and the environment, confirmed Salt Session representative Polly Davenport. 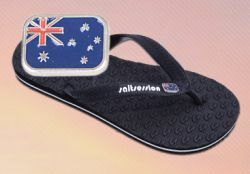 Retailing for $19.95 for the standard range, every pair of thongs sold would donate 25 cents back to the Ocean through conservation groups Sea Shepherd and Clean Ocean, she said. Representatives from the brand – which is securing stockists in the surf retail sector and recently scored a deal with leading thong e-retailer Rivetz – were among the visitors to Australian Shoe Fair over the weekend. “We hope to exhibit in future, and we really just wanted to check out the fair, have a look at some of the amazing stands and get some inspiration,” Davenport said.